I am in awe at the size of this lass! Absolute unit! A lieutenant of the Black Order, Proxima Midnight serves Thanos in his quest for ultimate power. Proxima Midnight, like the rest of the Black Order, was created for Jonathan Hickman's Avengers run - or, more specifically, for the big crossover he was building toward. She's a generic warrior woman: stronger, faster, more durable, all that usual stuff. There's really not a lot to say about her, because she really doesn't have a personality or backstory, so instead, how about this: did you ever consider that Marvel giving Thanos a gang of minions was just an attempt to pre-emptively "Fourth World" the character before Darkseid shows up in DC movies, so the public-at-large will think New Gods is the rip-off? You know DC going to try to bring Apokolips and New Genesis in eventually - you don't start with Steppenwolf unless you plan to go somewhere with it, and being the evil demigod of a whole group of crazies was always Darkseid's claim to fame. 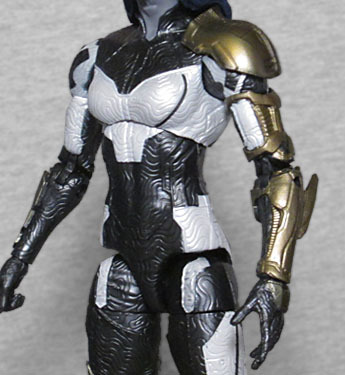 So, first things first: Proxima Midnight is a gigantic figure. There aren't a lot of lines where she wouldn't look amazingly tall - the toy is more than 7½" tall, making her at least a head taller than the average male Marvel Legend, but she wouldn't look petite next to a Marvel Select release, or even NECA product. She's massive, and has an athletic physique - broad shoulders, a proportional bustline, narrow waist... it's the quintessential "inverted V" body type, and the sculptors have taken advantage of her size to cover her comic-inspired black and white costume with an intricate series of lines that look rather like wood grain, like this girl was carved from a tree. She wears golden armor on her left arm, just as in the comics, but the movie costume adds to that with a little more on the right forearm and right leg. Comic Proxima wears a sleek black suit with a white panel over the chest. 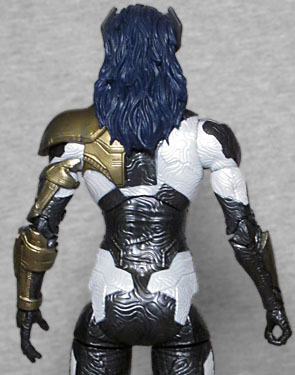 The movie version adds more white on the back, arms, hips, and legs, but the idea is still the same. 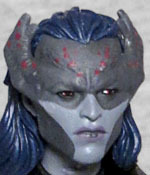 Her odd black mask, with its flared "horns" has been toned down, but is still strongly referenced by this design - the stock photo on the back of the box almost makes it look like an anatomical feature, but the paint on the final figure makes it clear the mask is separate from her blue skin. The costume changes make sense. On the printed page, a flat black body can be accented at will to stand out from the background, but in live-action (even CGI'd live-action), she'd just blend in with the scenery. Adding more white breaks up the form, and the fact that the pattern isn't the same on the front and the back will help our brains understand which direction she's moving even in quick glimpses. The additional armor helps balance out the design, and the blues of her skin and hair are less vibrant than in the comics, so they'll look more natural. Proxy moves at the head, neck, shoulders, biceps, elbows, wrists, torso, hips, thighs, knees, and ankles. Her hair hangs against her back, so that can limit the head a little bit, and the shoulder armor means she can only raise her left arm so far, but she's still plenty poseable. Her weapon is a three-pronged spear (perfect for killing three vampires all hudled up) that's golden and just slightly taller than she is. It doesn't look much like the version she uses in the comics, but a spear is a spear. It's a very soft plastic, though, and gets warped like heck in the tray. The tips look like closed pairs of scissors, so maybe the secret to beating her is to use rocks. She includes a piece of this series' Build-A-Figure, Thanos. Given her size, you'd almost expect it to be the head, but no, keeping with tradition, she gets the big, chunky torso. His armor almost looks silver instead of gold, oddly. If the Black Order really are Marvel's "New Gods," then Proxima Midnight is their Big Barda - in that she's female, and she's a giant fighter. In the comics, she's married to Corvus Glaive (the team's leader) and Black Dwarf (the massive ogre-lookin' dude) is her brother. The movie materials refer to them as "the Children of Thanos," so it's possible Gamora and Nebula consider them siblings. It's also possible that's just a title, and not a designation. 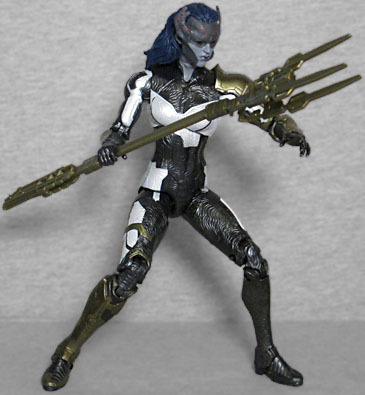 Either way, Proxima Midnight is a good-lookin' toy and a fair representation of what we've seen of the movie character so far.